Boy, 12, was holding a toy gun when he was shot and killed. The video of a Cleveland police officer shooting a 12-year-old boy who had a toy gun was released today after the department consulted with the boy's family. 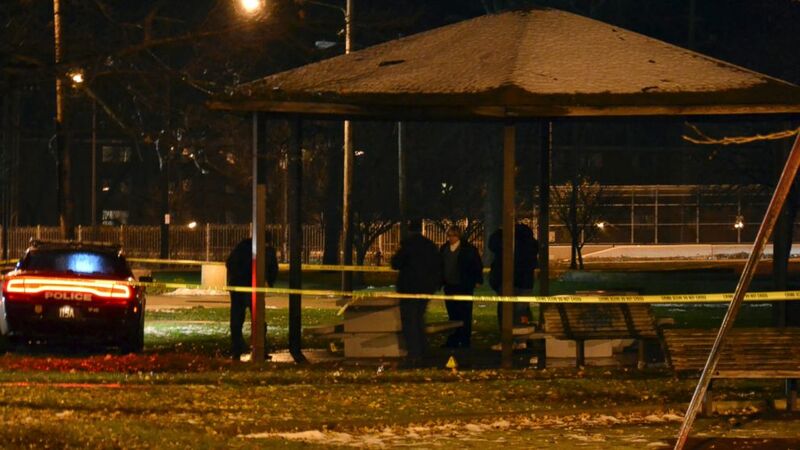 Police initially withheld the video from the public while discussing handling of the disturbing footage with the family of Tamir Rice, the boy who was shot in a playground on Saturday. "The family did not initially want the video to be released, but after reviewing it... expressed their wish to us" to make it public, Cleveland Police Chief Calvin Williams said today. Williams urged the public and the media to be cautious in the handling of the video. "I want people to bear in mind this is a 12-year-old boy. ... The family will have to view it over and over," he said. Rice was killed after a 911 caller reported a boy waving a gun around. The orange dot that is put in the barrel of toy guns had been removed and police said it was indistinguishable from a real weapon. “We are honoring the wishes of the family in releasing this and also in the spirit of being open and fair with our community,” Deputy Chief Ed Tomba said. The grainy video shows Rice walking around the playground and the sidewalk, occasionally pointing the toy at passersby or at objects. Police played a recording of a 911 call a man made after spotting the boy brandishing the toy gun and narrated the video because at times it is hard to see details of the video. (Cory Schaffer/Northeast Ohio Media Group/AP Photo) Cleveland police investigate a scene after an officer fired two shots, killing 12-year-old Tamir E. Rice, who police said pulled a gun from his waistband, Nov. 22, 2014. "He's sitting on the swing right now, but he keeps pulling it in and out of his pants and pointing it at people," the caller said. "I don't know if it's real or not," the caller added. The video shows the caller sitting in a gazebo near the boy and walking away before police arrive. A police car pulled up and two officers, Timothy Loehmann and Frank Garmback, exited the car, drawing their weapons. An officer gave the boy an order three times to "show your hands" before shooting him, Tomba said. Loehmann, 26, a rookie who joined the force in March, fired the fatal shot, a police spokesperson said. Garmback, 46, had been an officer since 2008. Police also played the 911 dispatcher's message to police, relaying the 911 caller's report. "He keeps pulling the gun out of his pants and pointing it at people," the dispatcher says. It's not clear if police knew the caller had mentioned the gun could be fake. "Shots fired. Male down. Black male. Maybe 20," an officer said in the 911 recording reporting Rice had been shot. Rice's family issued a statement after the video was released, saying that the "situation could have been avoided and that Tamir should still be here with us." "The video shows one thing distinctly: the police officers reacted quickly," read the family's statement in part. "We understand that some of you are hurt, angry and sad about our loss. But let’s use those emotions in a way that will contribute to positive efforts and solutions that bring change to Cleveland, Northeast Ohio and cities across the nation as it relates to how law enforcement officials interact with citizens of color." Both officers are on administrative leave during the investigation, Tomba said. Police tried to revive the boy after the shooting, Tomba said. "Tamir was given first aid in under four minutes and approximately three minutes after that, our emergency service showed up and they provided medical service to the young man," he said.